When I was in Toronto last week for some much-needed rest and relaxation, I popped into the bookstore where my good buddy works. I was wearing my Blue Rodeo 25 Years t-shirt. My buddy, clearly joking, asked, “Oh, Blue Rodeo? I’ve never heard of them. Tell me a little about them.” Before I could say anything much, one of the other staff members said, “Oh, yeah, Hook, that’s one of theirs.” I don’t know this guy, so I didn’t know if he was taking the piss; I’m thinking, “Umm, that’s Blues Traveler. Does he know that?” But almost right away he says, “Oh, no, that’s Blues Traveler.” I still don’t know if he was kidding, but if I had, I would’ve found it pretty damn funny. 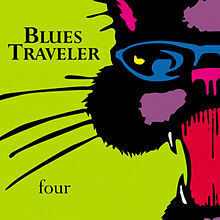 In honour of this rather amusing situation, this week’s instalment of Music Monday is Blues Traveler‘s 1995 classic, Hook, from their widely popular album, Four. There’s no cover here, except maybe this lip sync battle. For comparison, the second track is Blue Rodeo‘s single, Better Off As We Are, which was released around the same time as Hook. This entry was posted in Music Monday, People and tagged Better Off As We Are, Blue Rodeo, Emma Stone, Hook, Jimmy Fallon, music, video.